Argentina has condemned a planned visit to the Falkland Islands by UK MPs as another sign of Britain's "militarisation" of the South Atlantic. The plans for a visit by members of the Commons defence select committee emerged on Tuesday. Tension over the islands - which Argentina claims as the Malvinas - has been rising in the run-up to the 30th anniversary of the Falklands war. 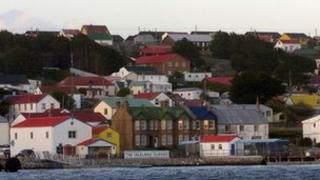 The UK has rejected Argentina's calls for talks on the islands' sovereignty. "The UK has transformed the Malvinas into the cornerstone of a system of military bases thousands of kilometres from London to control the South Atlantic, inter-oceanic routes, and the approaches to Antarctica," Argentina's foreign ministry said in a statement. It also repeated its claim that Britain had sent a nuclear submarine to the region. Members of the select committee have said their visit was not intended to exacerbate tensions with Argentina. Labour member Thomas Docherty said the Falklands were "an appropriate place" for the committee to visit, given the presence of British troops there. The last such visit was in 1999. The UK government has dismissed Argentine accusations of militarisation as "absurd" and says its defensive military posture has not changed. Prime Minister David Cameron has insisted there can be no negotiations on sovereignty as long as the Falkland islanders wish to remain British. The MPs' visit is expected to take place in March. If so, it would coincide with Prince William's tour of duty in the Falklands as an air force helicopter rescue pilot. HMS Dauntless, one of the UK's most modern warships, is also due to arrive in Falkands' waters next month in what the government says is a routine deployment. On 2 April, both nations will mark the 30th anniversary of the Falklands War, which began with an Argentine invasion of the islands and ended in victory for a British task force sent to recover them.